Our Staff has over 250 years of combined experience in the orthodontic & dental fields. We routinely attend education courses and seminars to learn about advancing technology and improving skills in order to make your orthodontic treatment as efficient and pleasant as possible. Gay began working for Dr. DeWitt back in 1988 shortly after he opened his practice on Mission Street, leaving the general dentistry field where she worked for 7 years. At that time there were only two employees, Gay and one orthodontic assistant. She manages the accounting, billing and keeps our computer system running smoothly! Her abilities and 36 plus years of experience are invaluable, and she adds plenty of Team Spirit to our group. Gay resides at Lake Isabella with her husband John. They have 5 children Chris, Jon, Joey, Traci, and Melany, and are blessed with 6 grandchildren! She is actively involved in community organizations and enjoys golf, boating, fishing, hunting and animals. 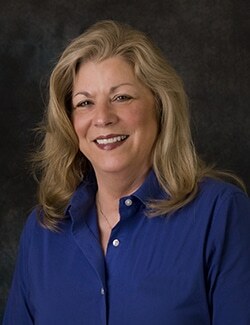 Eva started working for Dr. DeWitt in 1989, bringing 3 ½ years of orthodontic training with her. Eva’s 30 plus years of experience is extremely valuable to our office. There isn’t a challenge she hasn’t faced and conquered while displaying pride, patience and overall confidence. Eva and her husband, Doug, reside in Shepherd and have two children, and 2 grandchildren. The family enjoys camping, boating, sports, and their pets. Tammy joined our team in 1991 and has over 30 years of orthodontic experience. Tammy has an Associates Degree in dental assisting and graduated top of her class! Always ready to assist with poise and determination, Tammy continues to be a valued member of our team. Not only is she a skilled assistant, she is always thinking of new and innovative ideas that enrich our practice. Tammy resides in Lakeview with her husband Ken and has three children, and two grandchildren. She and her family enjoy spending time together, traveling, biking, and hiking. Linda joined our team in 2002 and now has over 25 years of dental experience. Linda’s business background and previous dental and customer service experience help to complete our team. Always ready to assist you, she compliments our front desk team, meeting and greeting all our patients with a big smile, a terrific personality, and a very contagious laugh! Linda lives in the Beal City area with her husband, Jerry. They have four children and 9 grandchildren. She loves gardening, reading and family activities. Theresa became part of our team in 1996. She has an Associates Degree in Dental Assisting. Combined with years of assisting in the general dental field, she brought with her an invaluable wealth of knowledge and skill now totaling over 30 years. With her kind, patient and composed demeanor, she is a valuable member of our team, always ready to work hard and get the job done. Theresa resides in Alma and enjoys family time, knitting and reading. She has two daughters (who were both star softball pitchers during their high school and college years) and one granddaughter. Heidi was welcomed to our team in 1999. Formerly one of our orthodontic patients, we recognized her great personality, as well as her steadfast manner and convinced her to become an orthodontic assistant with our office. Now with over 19 years of experience, Heidi has become one of our most skilled and valuable assistants. She also manages the responsibility of keeping our dental supplies complete. Heidi, her husband, Ian, and their son reside in Alma. Her hobbies include camping, boating, enjoying their pets and making jewelry. Sabrina joined our team in 2014. She is proud to be part of a profession that brings healthy rewards to so many in need of orthodontic care. Sabrina is pleased to introduce you to our office and will guide you through your initial examination. We know her pleasant personality and smile will make you feel comfortable during your visit and she is happy to answer any questions you may have regarding your treatment evaluation and plan. Sabrina earned a B.S. degree from Central Michigan University and currently lives in Alma with her three children. Her favorite activities consist of photography and spending time with her family. Amber joined our team in June 2017. Her past experience in the medical field is an asset. As our receptionist, Amber is eagerly ready to great you with her warm welcoming smile and professional manner. We are very fortunate to have Amber on our team! Amber resides in St. Louis with her husband, Ben. She enjoys reading, gardening, exercising, and participates in the Alma Highland Festival 5K every year. She loves spending time with family and friends. She has two feline members of her family named Carl & Herschel. Cliff has worked for Dr. DeWitt since 1987 when the office first opened. Cliff was a paramedic for 19 years at Central Michigan Community Hospital before changing his career path. Cliff studied in Buffalo, NY at the Great Lakes Laboratory, receiving certification in Orthodontic Model Sculpting. Along with model sculpting, Cliff also prepares the retainers for our finished orthodontic patients. His job does not end there…he is also responsible for our office maintenance, there’s nothing he can’t do! Cliff resides in Mt. Pleasant and enjoys his Miniature Pincher and loves being around people. Judy joined our team in 1996 bringing with her experience in the general dental field as well as a business background. With her vibrant personality and professional manner, Judy graces our team with her multitude of ideas, abilities, and implementation. Whether she is visiting dental offices, attending 4-H fairs, preparing newsletters, or organizing our patient fun days, she is always busy promoting our practice with her smile and warm personality. Judy resides in St. Louis with her husband Doug. They have two children, and five grandchildren. Her hobbies include gardening, crafts, and music. Jeri started working with us in 1996. She has worked in the orthodontic field for over 20 years as part of our team! Jeri enriches our team with her special artistic talents that are seen throughout our office. She is responsible for overseeing our OSHA guidelines by attending annual seminars and implementing updated OSHA compliance laws & training. Jeri resides in Shepherd and has two sons, and 9 grandchildren. Her hobbies include family activities, scrapbooking, sporting events, and spending time with her Miniature Pinchers.